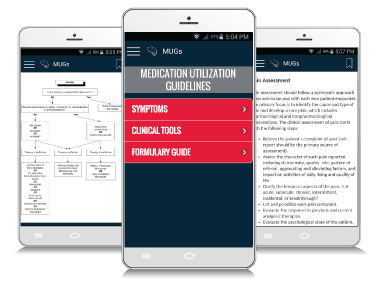 Exclusively designed for Enclara Pharmacia clients, the Medication Utilization Guidelines (MUGs) app is a comprehensive clinical resource designed for your mobile device that provides hospice clinicians ready access to pharmaceutical guidance based on patient symptoms and/or underlying conditions. Contact us today to learn more about our all of our clinical support resources and offerings including Medication Utilization Guidelines (MUGs). Already an Enclara Pharmacia client? Click on the link below from your mobile device or visit the App Store® or Google Play™ and search “Enclara Pharmacia MUGs” to download the free MUGs app today. To access the MUGs app simply enter your Enclara Pharmacia login credentials into the app. Don’t have a mobile device? Enclara Pharmacia clients can access the MUGs from any internet connected device by visiting our client login page. Click on the MUGs App Login button and enter your login credentials.